If you haven't yet made a balloon wreath, you have to make one! My sister and I made ours about a year and a half ago and I have used it so many times since then. When I first made the wreath, I wrote up a blog post with a balloon wreath tutorial and I'm excited to bring it to life again. 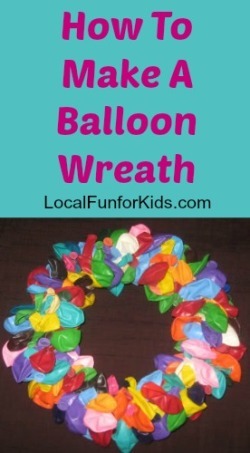 Balloon wreaths are incredibly easy to make. You don't need any special artistic talents or fancy materials. You just buy a few items at your local craft store and you can complete your wreath while chatting with friends and having a glass of wine. Some of my friends and I have always wanted to do girls craft night, and this would be a perfect project for a fun get together. These balloon wreaths are easy to customize for any occasion. You can use your school colors, holiday colors, or anything else you fancy. I like the plain ol' birthday balloon colors, because it's festive, colorful, and looks just as fun for my husband's birthday as it does for my 5-year-old.